Sauron is a character who appears in LEGO The Lord of the Rings: The Video Game. He is playable in his Annatar variant and as a smaller version of his armoured form. During the Second Age, Sauron wanted to conquer all of Middle Earth so he could rule all life in it. So he forged the One Ring, using it to corrupt the other ring bearers. The only people he managed to corrupt were the nine kings of men who wore rings, and they became the Ringwraiths. Because his previous plan failed, he gathered his dark forces and slowly began to conquer Middle-earth. But there were some who resisted. A Last Alliance of Elves and Men lead by Isildur, Elendil and Elrond attacked on the slopes of Mordor and slowly began to win the battle. But Sauron saw it and knew he had no choice but to come out and battle. He came out and killed many of the soldiers in the battle. He then attacked Elendil, killing him. His son, Isildur, picked up his father's broken sword, Narsil, and cuts off Sauron's finger with the One Ring on it. Sauron explodes and he loses his physical form. Isildur took the Ring, and Elrond told him to destroy it, but he refused. Later he was killed by Sauron's Orcs. The ring is later found by Deagol while fishing. Smeagol was with him and, since it was his birthday, he demanded the ring. When Deagol refused, Smeagol strangled him to death. The ring corrupted Smeagol, and he became Gollum, named after the horible swallowing noise he made with his throat. In The Hobbit trilogy, he becomes the sorcerer, the necromancer. A Hobbit named Bilbo Baggins discovers the ring in Gollum's cave. During the Lord of the Rings, he becomes The Eye of Sauron. Bilbo Baggins's nephew, Frodo, gets the ring and takes it into Mount Doom to destroy it, thus destroying Sauron. 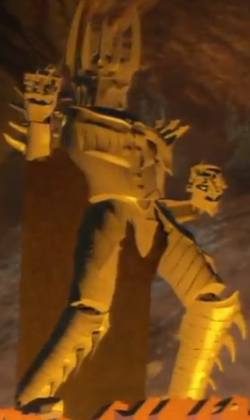 In the cutscenes and as a boss in the first level, Sauron does not seem to be a minifigure; rather, he appears to be made out of a combination of Knights' Kingdom II and Hero Factory elements, although there is a minifigure version that is an unlockable character. Sauron is unlocked in the Bonus Level of the LEGO Lord of the Rings video game, along with the Mouth of Sauron. It might be worth noting that Sauron as a minifigure (armoured) can smash Morgul LEGO so anyone could use him to destroy Big Sauron's mace in the Prologue level or destroy the Morgul LEGO surrounding Mordor in the bonus level. Sauron (armoured minifigure) also has super strength, so he can pull and move objects with orange handles.